The portable HUD works with a smartphone and Garmin app to generate navigation information. 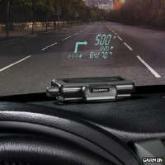 The gadget can project directional arrows, distances, current speed and speed limits on the windscreen. Information is projected via the HUD's attached reflector lens or on to a plastic film stuck to the window glass. The navigation system can also provide voice prompts via a smartphone's speaker or a car stereo that works with the Bluetooth short range radio technology. The app associated with the sat-nav system is available for iPhones, Android phones and Windows Phone 8 handsets. The HUD automatically adjusts brightness levels to ensure that projected information is easy to read during the day and at night. The Garmin HUD looked "interesting", said Tim Edwards, a principal engineer in the future transport technology division at motor industry research firm Mira. "Car makers are starting to do this themselves but their challenge has always been development lifecycles," he said. "Your smartphone changes almost daily but there's a limit to how fast a car can be updated." Mr Edwards said HUDs were starting to be standard in mid-range vehicles and were no longer confined to top-of-the-line models. However, he said, the add-ons and gadgets produced by firms such as Panasonic and Garmin that people use on their own cars might be a better driver's aide than those made by car manufacturers. "In a car, a HUD is usually built in and you cannot update it," he said. HUDs that project information on to windscreens can cut down on driver distraction as people spend less time looking down at instruments and more with their eyes on the road, he added. Such systems were likely to become more necessary as vehicles got progressively more autonomous because drivers would need to be quickly told if they suddenly needed to take over, said Mr Edwards. Garmin said its HUD would cost about $130 (£86) when it went on sale in late summer. Regional maps for the associated Garmin app will cost about $30 (£20) each.